You’re going to love decadent Vegan Peanut Butter Chocolate Pudding dessert that is healthy and refined sugar-free. I have a friend who hates avocados, but I’m seriously considering making this for him just to prove that they are awesome, ha ha. 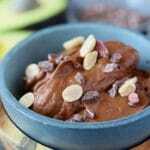 I’ve actually shared an avocado chocolate pudding recipe in the past, but this version that includes peanut butter was inspired by Dr. Joel Fuhrman’s new cookbook, Eat to Live Quick & Easy Cookbook. Dr. Fuhrman’s publisher said that I could share this deliciously simple recipe which I slightly adapted. I made this vegan dessert recipe in less than 5 minutes in my high-speed blender, so I can verify that it was indeed quick and easy. I topped the pudding with some cacao nibs and peanuts for crunch. The pudding itself was silky and incredibly creamy. You’d never believe it’s vegan! If you can’t tolerate peanut butter, then feel free to substitute almond butter. But, don’t even think about leaving out the avocados! 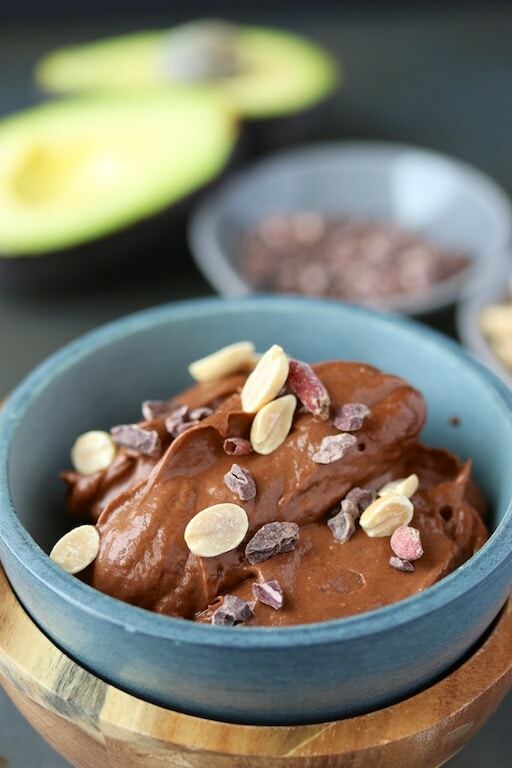 Also, if you want an even simpler recipe without any nut butter, you’ll probably like my Avocado Chocolate Pudding recipe. I made this Peanut Butter Chocolate Pudding last week and enjoyed it as my after-lunch treat. I was pleasantly surprised that it stayed fresh and not at all watery, even after several days in the fridge. The banana flavor is definitely prominent, but I didn’t mind it, especially since it helped make the pudding nice and sweet. Be sure to pin this vegan dessert recipe to save it for later! This decadent dessert that is completely dairy-free with creaminess coming from avocado. And, it’s refined sugar-free because it’s sweetened with dates and a ripe banana. 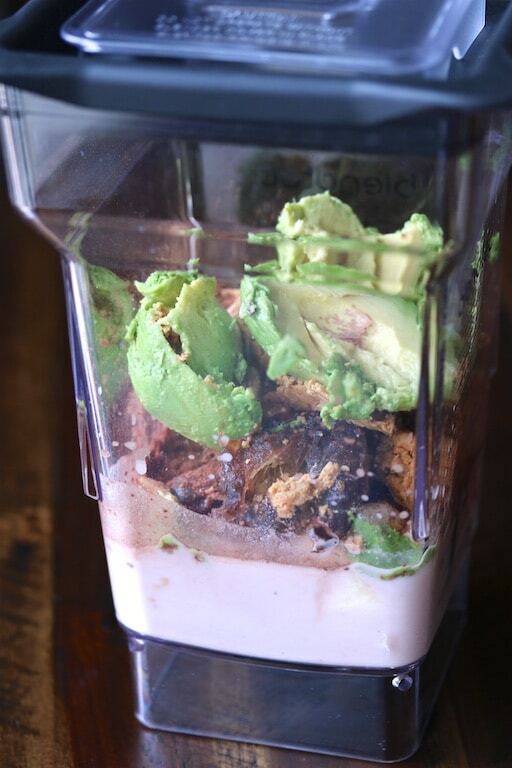 Combine the banana, avocado, peanut butter, cocoa powder, dates, and almond milk in a high-speed blender. Turn on high for 30 seconds or until blended completely. Serve immediately or chilled. Top with peanuts and/or cacao nibs, if desired. Store any leftovers in the refrigerator for up to 3 days. Join my weekly newsletter list to get all the latest news and recipe links delivered directly to your inbox. 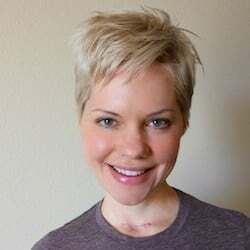 Looks great, Carrie! I have always loved avocados, but have been eating more lately as I’ve found they help me to lose weight. Who knew – more fat = less weight?! This looks like a yummy way to incorporate more. Thanks! That’s SO awesome, Linda!!! You’re so welcome for sharing the recipe. Enjoy! I wish I could say yes, Debbie, but it’s more like a PB Banana Cream Pie? The banana flavor is pretty strong, but I didn’t use as much PB or cocoa powder as in the original recipe. So, trying adding a bit more of those 2 ingredients and you might get your Reese’s! 🙂 XO. Avocado toast is now my favorite way to eat avocados. This recipe sounds very interesting! Carrie, I just made this pudding for my late night snack..it is so yummy! Thank you! I also tried to enter the contest for the cookbook and say how I like to eat avocados, not sure if it went through correctly. If not, my favorite way is in a mango, avocado salsa with jalepeno, green onions and lime juice. You can eat it with chips or roll it up in lettuce leaves. Super yummy! Oh good, Susan! I’m so happy it worked out for you. I just checked and you’re entered in the giveaway! Have a great weekend. XO. This pudding looks amazing! I’ve made avo puddings before but I love the date for sweetening – I’ve never done that before! And the PB just puts it over the top! YUM! I love that you sweeten this with dates! Such a yummy flavor combo. I love easy and fast recipes like this one that’s also healthy and delicious! Can’t wait to make it. Thanks, Jean!!! I hope you love this one. XO. This is the perfect recipe to highlight the magic of avocados! I also love them in salads. OOOo, I’ve made avocado pudding plenty of times but have never thought to put peanut butter/nut butter into it! What a great idea. Next time I make it I’m definitely going to try your version! I love avocado with just about everything. I use them most often in homemade soups – I top each serving with some. On top of soups and stews is how I love to use avocado too, Annette! XO. I love avocado pudding, adding peanut butter to the mix, yummo! I recently added it back in to my diet and boy, I forgot how delicious it is! Ohhh, it’s an exciting day when PB gets re-introduced, Cristina!!! I have to pace myself, but I am thrilled to have it back in my diet as well. XO! 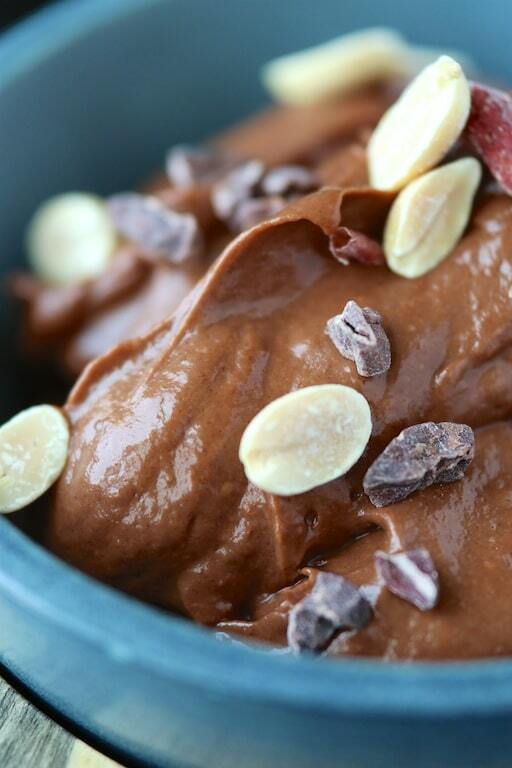 This looks like real deal pudding, but it’s completely healthy! I love that! Totally going to try this with AB! Ohhhh, let me know how it turns out, Jessica! XO! Thanks, Jo!!! P.S. Are you London-based? I’ll be there for a few days at the end of July…I’m trying to organize a paleo meet-up! Okay, looks like July 22-25th. I will keep you posted if I can organize something. XO. Chocolate and peanut butter is my favorite combo, and this looks absolutely dreamy! Thanks, Kari!!! Dreamy is a great description for chocolate + peanut butter. 🙂 XO! This looks like creamy, chocolaty, peanut butter heaven! And it’s vegan too! Thanks, Stacey!!! Have a great weekend. Love everything with chocolate !! This pudding will be perfect for after dinner dessert ! YUM !! 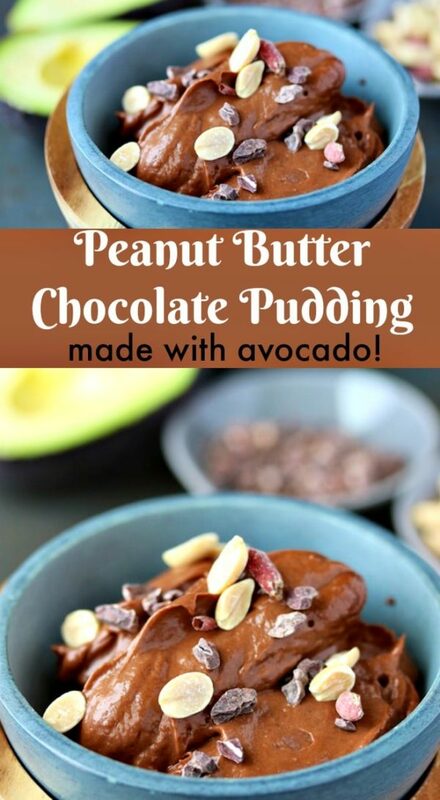 WOW you had me at the combination of chocolate and peanut butter – but avocado too!! Count me in! I don’t eat peanuts but I could try this with cashew and cashew butter? Looks seriously decadent. Yes, absolutely, Darryl! Cashew butter would be amazing. You don’t even need that much since the avocados are so rich. Oooh, I just love desserts with avocado! 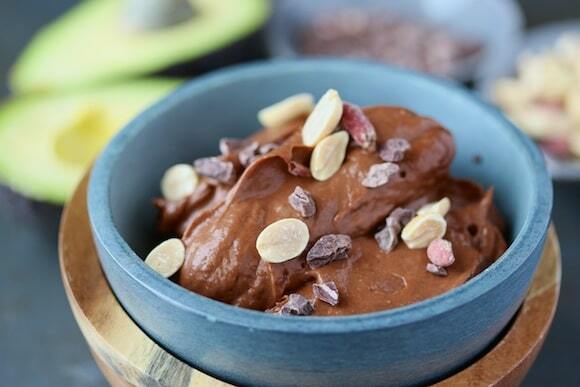 This is such a delicious spin on the classic avocado chocolate pudding. PB makes everything better, right?? Packed full of nutrients! This looks delicious!